KW automotive offers high quality tuning parts for many different cars and manufacturers. Their suspensions are used for race cars as well as on daily drivers. We had a look at their iSuspension, the latest product from the company from Fichtenberg, Germany. The KW DDC (Dynamic Damping Control) coilover with EDC (Electronic Control Unit) is one of the first aftermarket coil overs that offers an individual lowering in combination with an electronic damper setup. In addition to an adjustable suspension they now offer to change the setting in real time via iPhone or iPad. After downloading the App via Appstore, you can configure your suspension system individually wherever you are. It comes with three standard setups, which you can either choose via the DDC Button in your car or the App on your mobile Device. It offers Comfort, Sport or Sport+. If you want to have your personal setting, just go over to the Advanced Screen on your device. It shows the actual damping power in real time and gives the opportunity to adjust front and rear axle separately in either +/- 10 per cent steps or via fine-tuning. The Personal Screen afterwards lets you save up to five personal settings, which you can also share with friends via email. The most important thing here is not the application, it is the suspension that is supposed to be an improvement to the version that comes with the stock car and gives it an even sportier feeling. To get to know the difference and have a look on the improvement we got the opportunity to test this special suspension kit on a brand new Porsche 911 (991) Carrera S.
Our first drive started in Comfort mode and went onto highway and land roads. There was a tiny difference noticed between the stock suspension in comfort mode and the KW system. It is a little stiffer, but keeps the sporty character of the car. Changing to Sport mode meant you promptly felt a difference in handling and steering, but it did not feel like an improvement over the stock system so we switched to Sport+ and suddenly we felt king of the road. There was no way we wanted to switch back to any other mode. 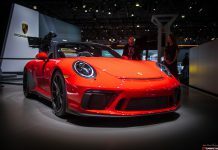 Earlier this year we criticized the stock 991 Carrera S being too much of a daily driver for interested Porsche drivers like bankers, managers and 65-year-old retired men fulfilling their boyhood dreams. 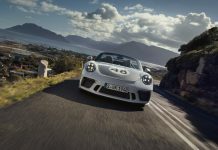 The KW iSuspension transforms the sports car carrying the name Porsche with pride. The new kit adds an even sportier feeling, provide the ability to adjust the suspension for everyday use in real time and gives ultimate gadgets the option to tune car using a mobile device.